Hi all. Today we got the accepted manuscript version of Ely and Case's redescription of of the Naze dromaeosaur, initially briefly reported by Case et al. (2007). The authors name it Imperobator and recover it as a paravian using Gianechini et al. 's (2018) version of Brusatte's TWiG analysis. Despite the paper being titled "Phylogeny of a new gigantic paravian (Theropoda; Coelurosauria; Maniraptora) from the Upper Cretaceous of James Ross Island, Antarctica", the only hint at the size besides scale bars is "The approximate length of the pedal ungual of digit II in Utahraptor is 10 cm (approximate measurement made by one of the authors based on illustrations provided by Kirkland et al., 1993), and although the distal half of the pedal ungual in Imperobator is missing, an estimate for its total length would be 4-5 cm." Their figure 7C suggests pedal phalanx IV-1 is 61 mm long, compared to 44.7 mm in Deinonychus specimen AMNH 3015, which would scale to 4.18 m using Paul's (1988) estimate. For another comparison, the distal tibia is 60 mm wide according to figure 5A, while AMNH 3015's is 63.3 mm. This would be 2.90 m if scaled to Paul's estimated length. So Imperobator was ~3-4 meters long as far as I can tell. Is that gigantic? Reconstruction of the pes of Imperobator antarcticus (UCMP 276000) after Ely and Case (2019). "The dentition is poorly preserved except for two teeth that were preserved in a fragment of concretion. The teeth and the associated fragments all indicate long, narrow biconvex teeth. This shape suggests that both anterior and posterior carina were present; however, no serrations were noted on the carina, thus it is impossible to determine if serrations were present or absent. The teeth are incipiently laterally compressed, but retain a rounded outline, particularly anteriorly. The shape is indicative of teeth from the anterior region of the jaw." "Potential material from digit I may be present (Fig. 7D). It is distinguished by what may be a prominent flexor heel on the proximoventral surface, morphologically similar to that of the dromaeosaurid (avialan?) Balaur bondoc (Csiki et al. 2010)." ... confusing, as 7D seems to be the proximal half of a non-ungual phalanx positioned as III-1 in Case et al. (2007). In the materials list, Ely and Case also state "material from metatarsal I, and even metatarsal V may be preserved", but we get no description or illustration of these. 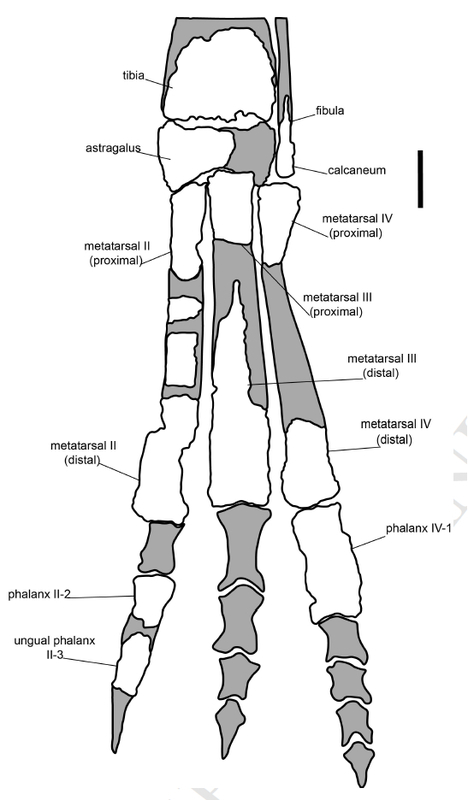 Note contra line 428, fibular fusion is absent in Buitreraptor and Graciliraptor. Holotype of Imperobator antarcticus (UCMP 276000) as photographed by Case et al. (2007). 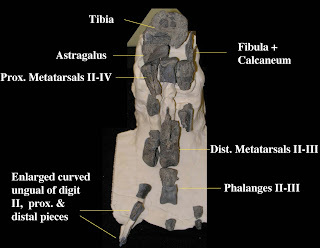 Distal phalanges of digits III and IV not described by Ely and Case (2019), and distal metatarsal IV and phalanx IV-1 missing. As regards the phylogeny, Ely and Case find Imperobator to fall out in Paraves in a polytomy with eudromaeosaurian and anchiornithine OTUs. They reran this as a Bayesian analysis which favored placing it among anchiornithines, although exclusion from Dromaeosauridae was just barely supported at 50%. While the authors seem to favor a basal position, as in their 2016 SVP abstract where it emerged as a basal deinonychosaur, their analyses suggests an anchiornithine troodontid or eudromaeosaurian dromaeosaurid placement are about equally supported. Imperobator was included in the Lori analysis (as the 'Naze dromaeosaur') and had a highly unstable position. Rescoring it given the new paper and assuming the teeth cannot be assigned to the taxon, it now emerges as a halszkaraptorine. Interesting. References- Paul, 1988. Predatory Dinosaurs of the World. Simon and Schuster. 464 pp. Naaa: that's surely due to spurious symplesiomorphies and taxon sampling bias (no Petersian joke here). See my comments very soon on Theropoda blog. Your conclusion was (translated) "It turns out to be an avetheropod of uncertain position: among the various positions in which it can be placed, it could be either an allosauroid or a therizinosauroid. ... I therefore believe that the position of Imperobator is likely to vary depending on how the known remains are interpreted and how large the taxon sampling is for comparison. I therefore consider it fair to classify it as Tetanurae incertae sedis pending new remains." Which in a sense, I can agree with. It only takes a single step to move Imperobator to Allosauroidea or Therizinosauria in the Lori matrix for instance, so I certainly wouldn't claim it's strongly supported as a halszkaraptorine. The thing's so fragmentary and still not described in much detail (e.g. the tibia's outline in distal view could strengthen a coelurosaurian identification if we knew what it was), so that there's a huge range of positions it can be moved to without many extra steps. That being said, pedal phalanx II-2 (fig. 7A) does have that classic deinonychosaurian shape with the proximoventral expansion and up-swooped dorsal margin that I can't recall seeing in any phalanges outside Paraves. And whatever character(s) could be made from that qualitative description aren't in the Lori matrix. So in the absence of anything clearly non-paravian about the specimen, I do think it most likely goes there. And given that, its unreduced proximal metatarsal III, general lack of fusion at large size and pedal ungual II lacking much curvature or enlargement match halszkaraptorines like Mahakala. Biogeographically it might make more sense as an unenlagiine that evolved a robust foot at large size, and that's just one step longer as well. In conclusion, I think with fragmentary specimens that have an uncertain position due to a lack of scorable characters, we should look outside the limited anatomy covered by our matrix to evaluate details we don't score for (yet). Nesbitt et al. (2007) is a classic work guilty of not doing this, with numerous specimens just thrown into Archosauria indet. or Archosauriformes indet. because the characters in Nesbitt's matrix can't pin them down further, when I bet that if you tried you could find variable differences between taxa. And in the present case I'd feel justified placing Imperobator in Paraves, and comfortable listing it under ?Halskzaraptorinae pending further information. As I wrote in my post, most of the identifications in that paper are ambiguous, and cannot be surely trusted. I disagree with almost all phalangeal identifications. Such PII-2 fragment may be from the fourth toe. Their big PIV-I may be PIII-1. In any case, I have scored the PII-2 proximoventral heel in Imperobator, but it turns out non-paravian in any case. Intriguingly, my new iteration of the analysis with full set of taxa places Imperobator in megaraptoran root, which may be paleogeographically more plausible than any other scenario, given megaraptorans in both South America and Australia. Well, 3.4 m is Achillobator/Utahraptor size, so it surely is gigantic, no? No, it isn't: Deinonychus too is in 3-4 m range. Andrea's correct. For comparison, Imperobator's distal tibia is 60 mm wide, but Achillobator's is 113 mm (1.88 times the size), Utahraptor's paratype CEU 184v.260 is 145 mm (2.42 times) and Austroraptor's holotype is 140 mm (2.33 times). "the second named Antarctic Mesozoic theropod"
Fourth after Cryolophosaurus, Polarornis, and Vegavis. Well second non-avian theropod from the Antarctic. Sixth non-avian dinosaur from the Antarctic. The others being Glacialisaurus, Cryolophosaurus, Morrosaurus, Trinisaura, and Antarctopelta. Well, yes, but the title of the post says "Mesozoic theropod", not "non-avian theropod" or "non-avian dinosaur". Yeah, forgot about the vegaviids there... oops. It's actually amazing, and highly encouraging, that so much about its phylogenetic position can be said from an isolated foot. 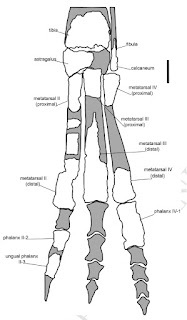 Theropod feed are very informative (in my data set, there are 126 characters of the metatarsus and toes: about 7% of the char. list). Unfortunately, this specimen is not that informative as the manuscript states.